A great place to stay while visiting the Yosemite area, this newly redecorated mountain home features 8 rooms to accommodate your family. The upstairs master bedroom has a king-size bed with a sleigh-style wood frame, and an attached full bathroom with a jet tub and a separate shower. The first floor has two full bedrooms with king- and queen-sized bed, and the bathroom has a beautifully tiled shower. The large modern kitchen has a dish washer and microwave oven among other appliances. The dining table seats 6, and a high chair for toddler is provided as well. The outside deck area is great for grilling, and there are tables and chairs on the covered porch. 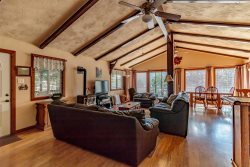 The home is conveniently located in Oakhurst, 20 minutes from the south entrance of Yosemite National Park, and near the Bass Lake resort area — close to both grocery stores & restaurants. Come and enjoy everything our beautiful area has to offer while staying at this comfortable mountain house. It was exactly what we were looking for. It was perfect.